It’s finally spring! A season filled with with vegetable forward dishes, bright fruits, refreshing drinks and al fresco dining. We shake off the heavy, rich dishes of winter in favor of vibrant color and delicate, light flavors. 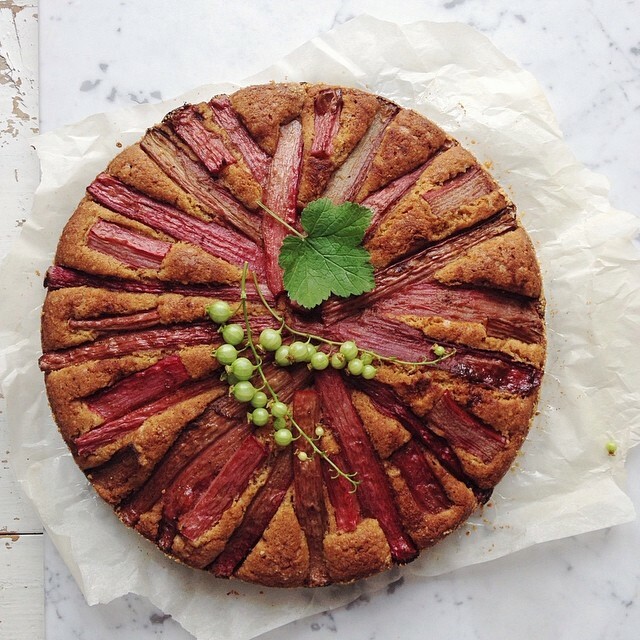 Spring vegetables like rhubarb, peas, asparagus and artichokes, and fruits like strawberries are filling the plates of the feedfeed community, and finding their way into spring soups, salads, dressings, cakes, galettes, and in celebratory cocktails. The fleeting nature of some of these gifts of Spring should motivate you to make the most of them, so fill your farmers’ market baskets and focus your cooking on simple preparations with the ingredients as the stars! Rhubarb is that quintessential sweet ‘n’ sour spring vegetable that is so beautifully made into bright pink warm pies or cakes...but, I am really enamored by some creative ways our contributors are using rhubarb in ‘cooler’ ways on our Rhubarb feed (in salads, cocktails, chutneys, popsicles), curated by editor Brian Halweil, like this inventive velvety Coconut Sorbet with Strawberry Rhubarb Sauce. Finally, I am inspired by this Rhubarb Apple Pie Smoothie, made with roasted rhubarb, apples and lychee. Peas are my spring pick for a savory craving. There are so many lovely ways peas are being used aside from just soup (although we love pea soup too!). They are topping toast, flatbreads and pizza, pureed or whole, and being combined with pasta and noodles - and even made into a lovely green pea cake! These inventive Pea and Mascarpone Hand Pies from our Peas feed are perfect if you’re craving a filling, meat-free meal. Asparagus salutes spring with its dramatic straight pursuit of the sun! People that disparage Asparagus might not realize the myriad of ways you can prepare them, shaved raw into ribbons (topping pizza), mandolined raw into salads, chopped and lightly steamed or roasted into pastas, and many more ways to surely find a place in your heart. Try Asparagus in this Avocado, Amaranth, Salmon, Edamame & Poached Egg Salad With Rhubarb-Miso Dressing. 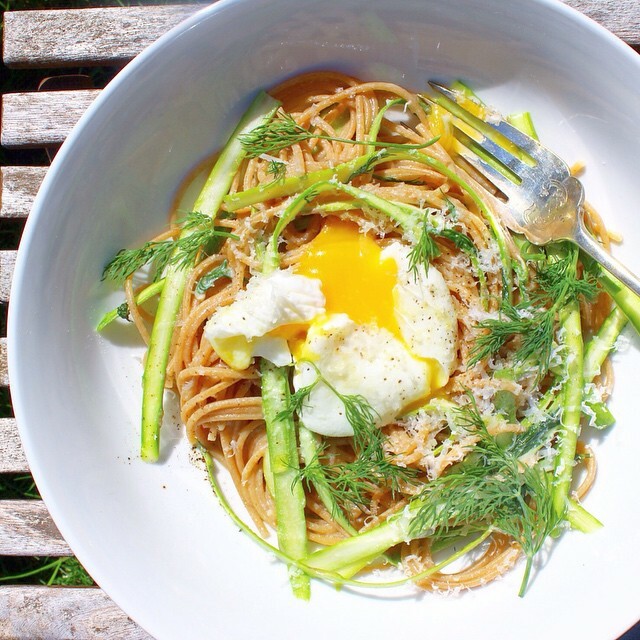 Pasta and Eggs are a natural pairing in this Asparagus Ribbons with Spaghettini and Poached Egg dish Finally, if you are looking for a crowd pleaser, I am especially crazy about these Asparagus baked in fry-form with roasted garlic aioli - the perfect spring French fry. Since everyone is aching to break out their grills and get the fire going, we present you the Artichokes feed! Nothing loves the heat as much as artichoke and the Artichokes feed is filled with fun ways to grill (and bake or braise) this prickly veggie: artichokes bathed in chimichurri sauce, drenched in lemon and Worcestershire aioli, or dressed in sichuan and stuffed. Have you ever stuffed an artichoke? You are missing out - check out the Artichoke feed for tons of ways to do it. I am hooked on stuffing them ever since eating them stuffed as street food in New Orleans (but that is for another story). Spring has motivated me to find new ways to incorporate both veggies and fruits into cocktails. 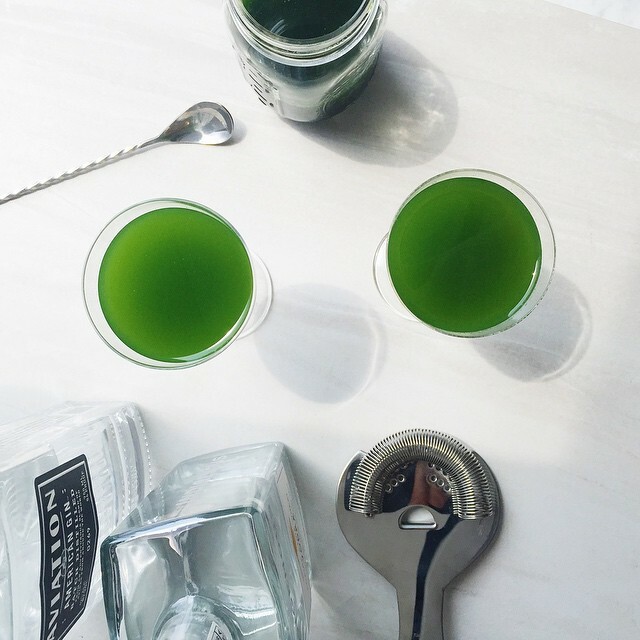 I’ve seen an abundance of naturally bright, jewel-toned cocktails thanks to fruits and vegetables like grapefruit, pineapple, tomato (even arugula!) on our Spring Cocktails feed edited by Ashley Marti. Our contributors really put a spin on the classics like margaritas, palomas and gin and tonics: They’re flavoring cocktails with fresh herbs and spices like rosehip, lavender, ginger, mint, jalapeño, pepper and rosemary. And they’re so beautifully garnished! Simple citrus fruit peel twists such as orange, sprigs of herbs like lavender, and chunks of fruit (grilled pineapple - yum) delicately hang on thickly salted glass rims or are skewered onto gorgeously carved toothpicks to add an extra touch of Spring to already stunning drinks. I love blending bright greens, like kale and leeks, and tubers like sunchokes into a quick and easy soups. I’ve also been nose deep in noodle bowls for lunch like pho and udon with sesame and and cucumber - there are lots of cooling noodle bowls this season. Check out more on our Spring Soups feed, curated by Sasha Swerdloff. Don’t worry - I didn’t forget about the sweet stuff. Strawberries take the lead in spring, in cakes, ice cream and even on toast! 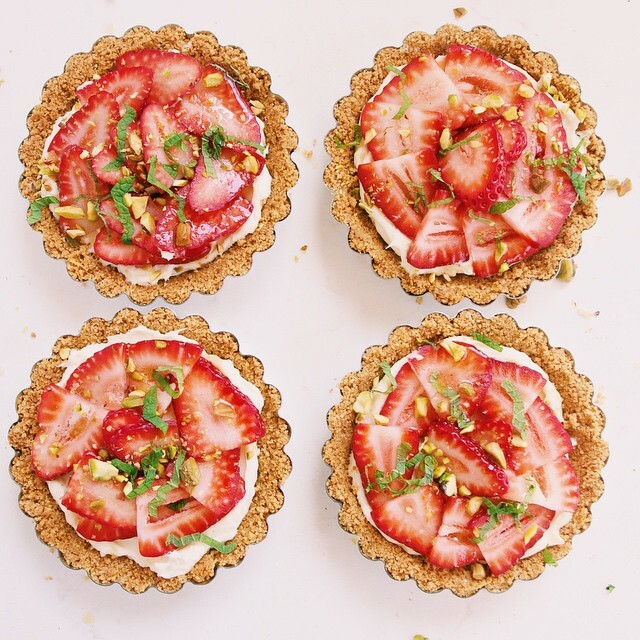 Completely digging these Strawberry Tartlets with Mascarpone Cheese in a Pretzel Crust - yes, pretzel crust. I was particularly inspired by this savory approach of adding some chopped strawberries with basil, red onion, a squeeze of lime to top over crispy salmon.